Mapa tofu (also called “mapo tofu” or “mapo doufu“) is one of the most popular Chinese Korean dishes in Korea along with jjajangmyeon and tangsuyuk. Koreans call this dish “mapa dubu.” I use chicken breast but you could use pork or beef. Every family seems to have their own version of mapadubu, and you could even use hot pepper paste if you want. The good thing about mapa tofu is that it’s a well balanced meal in one dish, made with cheap ingredients, and delicious. You won’t need any other side dishes with this. If you’re a vegetarian, skip the chicken and use vegetable stock instead of water, or use mushrooms. 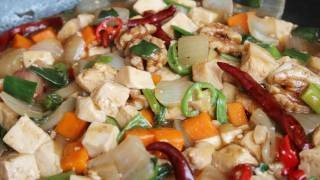 1 package of tofu, chicken breast, green onions, green chili pepper, red chili pepper, dried red chili peppers, ground black pepper, carrot, onion, walnuts, garlic, ginger, vegetable oil, sesame oil, oyster sauce, and potato starch powder. Take the tofu (14 oz: 400 grams) out of the package and rinse it in cold water. Pat dry with a kitchen towel or cotton cloth. Cut it into ½ inch cubes and set aside. Cut ½ pound (about 230 grams) of chicken breast into ½ inch cubes and set aside. Cut ¾ cup’s worth carrot (1 medium sized carrot) into ½ inch cubes and set aside. Cut 1½ cups’ worth of a large onion into chunks and set aside. Cut 7 stalks of green onions into pieces ¼ inch long and set aside. Chop 1 green chili pepper and 1 red chili pepper and set aside. Mince 4 cloves of garlic and 1 ts worth ginger and set aside. Heat up a wok and add 1-2 tbs vegetable oil. Add 3 small dried chili peppers, the minced garlic, and the ginger. Stir for 10-15 seconds. Add the chicken. Stir and cook for a few minutes. Add 1 ts ground black pepper, the chopped carrot and onion, ½ cup walnuts, ¼ cup oyster sauce, and 1 cup of water. Let it cook for 8-10 minutes until the chicken is cooked thoroughly and the onion looks translucent. Add tofu and stir gently with a wooden spoon. Add the chopped green onions and green and red chili peppers. Stir occasionally and let it cook for a few minutes. Mix 1 tbs starch powder and 1 tbs water in a small bowl so the starch is dissolved. Then pour it into the wok gently. Add 1 ts sesame oil. Transfer to a wide bowl and serve hot with rice. Posted on Tuesday, November 1st, 2011 at 7:40 pm. Last updated on October 5, 2014. Posted February 9th, 2017 at 2:52 pm | Log in to reply. Thanks again for your delicious recipes. I again veganized this recipe by using mushrooms in place of chicken, I also used put in freshly cut mung bean sprouts that you taught me how to grow and a big handful of spinach at the end just till wilted. It was soooo yummy! Posted August 25th, 2016 at 9:56 pm | Log in to reply. Posted June 4th, 2015 at 9:53 pm | Log in to reply. Thank you for this recipe. I made it tonight for my (Korean) girlfriend, and she said she liked it very much! She’s vegetarian, so I used white mushrooms instead of chicken, and regular low sodium soy sauce instead of the oyster sauce – I should have read all the comments to see about combining the soy sauce with bean paste, I’ll try that next time. Only thing is she said it wasn’t quite like her Mom made while she was growing up, so we think next time I should add some gochuchang for a little more of a kick. Either way, I’m thrilled to be able to cook her some Korean foods she really enjoys. Thank you again!! Posted June 5th, 2015 at 11:07 am | Log in to reply. Thank you for sharing the photo and the story about your cooking mapa tofu! It sounds very healthy and delicious! Congratulations! Posted February 25th, 2014 at 8:05 am | Log in to reply. Posted February 25th, 2014 at 9:24 am | Log in to reply. Adding some Szechuan chili peppers sound great to me! Posted August 20th, 2013 at 4:04 pm | Log in to reply. can I add zucchini or courgette ? to this dish ? 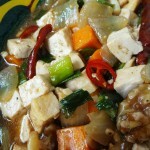 This recipe was originally posted on November 1, 2011 at 7:40 pm by Maangchi. It was last updated on October 5, 2014. The video was watched 281,651 times on YouTube & has 2,588 likes!